Professional quality 9 piece set of extra long 150mm bits. Comprises: PH1, 2 and 3, PZD 1, 2 and 3 and slotted 3, 5 and 7mm. 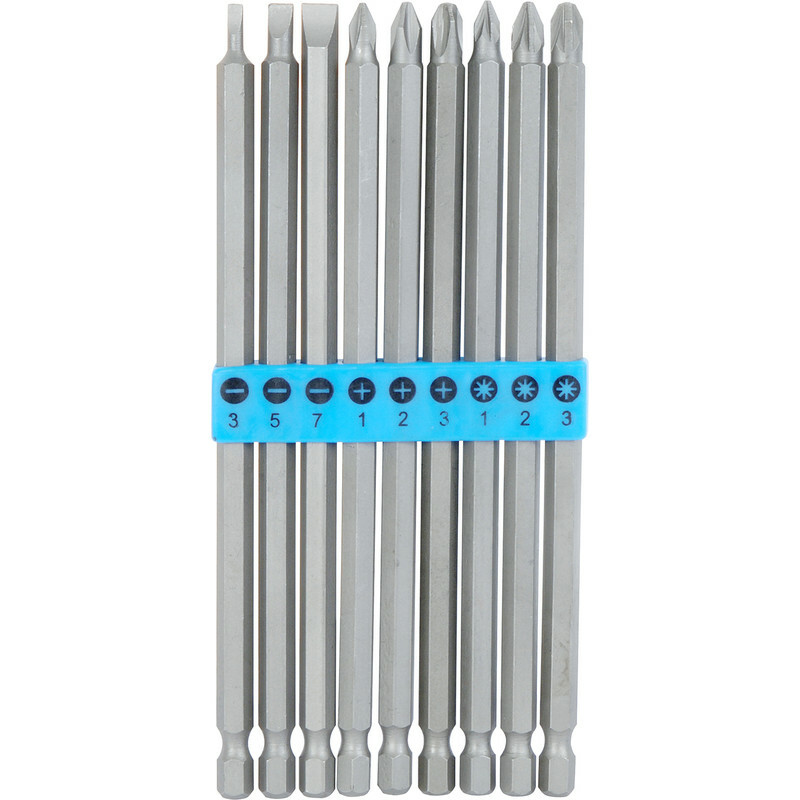 Extra Long Screwdriver Bit Set (9 Piece) is rated 3.5 out of 5 by 21. Rated 4 out of 5 by vinn from product is great value for money sturdy product bought this item 2 weeks ago in that time had a lot of use very pleased with product and price. Rated 5 out of 5 by Tboner from Does exactly what it says on the tin ! Wanted some long bits for occasionally doing some long reach cabinet work so did not want to go over the top , these fitted the bill perfectly as did the service I received from toolstation as usual, fast delivery service and done with a professional quality of service as well even on a small order , Spot on all round. Bits are not heavy duty for monster torque work etc but at a budget price they are spot on got general light weight work , the glue well it’s glue lol . Rated 5 out of 5 by FredH from Look to be good quality I broke my long screwdriver that I use for pocket screw joints , this solves the problem really well, In fact I bought 3 sets ! Rated 4 out of 5 by KenH from Great value but for limited use Bought this for a specific job and managed to do the job even though one broke quite easily. Great value anyway. Rated 2 out of 5 by Peaches from Very weak Used to remove awkward screws but the tips wore down very quickly. Too weak will get the job done if only a couple of screws.